This past Monday, the reliably bonkers FX comedy Archer kicked off its fifth season with an excellent episode that set the criminally incompetent spies at ISIS up with a new gig as actual criminals. Buried within the gargantuan pile of jokes was a bit about how ISIS secretary/arson enthusiast Cheryl Tunt planned to become a country singer; she even sung over the episode's closing minutes. People watching at home could be forgiven for thinking it was just a throwaway gag, but not only will Cheryl's country career be an ongoing story arc, it seems FX will also be releasing a 12-track digital album of original Cherlene songs on February 17. The album, tastefully titled Cherlene, will feature songs with Cheryl-ish titles like "It's All About Me," "I'll Burn It Down," and "Gypsy Woman." 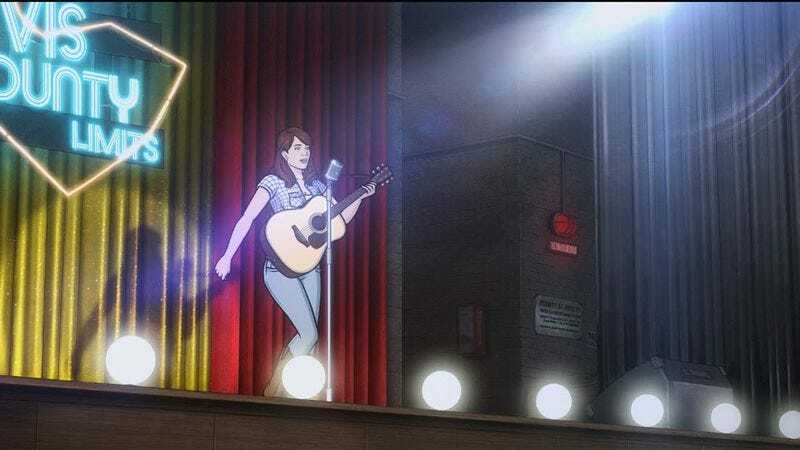 In a nod to one of the series' many, many recurring jokes, it will also feature a cover of Kenny Loggins' "Danger Zone," with Loggins himself joining Cherlene for a duet on one of Sterling Archer's favorite tunes. All of the tracks were produced by Kevin Kinney, frontman for the Southern rock band Drivin' N' Cryin', with country singer Jessy Lynn Martens providing Cherlene’s voice. The ambitious project certainly bodes well for the show's fifth season: If the Archer team cares enough to put this much thought into a tie-in project, imagine how hard they must have worked on the actual episodes.